SCREECHING FEATURES• 35+ crazy new levels and 4 worlds to conquer! • Outrun enemy cars trying to devour you!• Perform flips, tricks and stunts and rule the streets!• Collect super cool upgrades to enhance your vehicle!• Insane cartoon style graphics!• Burn rubber and watch enemies eat your dust! DRIVING MADNESSThis rocket-fast game requires some serious driving skills. Jump over obstacles, avoid oncoming cars, swerve left and right of objects and collect super boosters to go even faster! Before you know it, you’ll be on the tracks slamming into cars and fighting your way to first place! STEER CLEAR OF THE BITERSBeware of biting enemy cars that try to devour you as you drive through troublesome levels. They are nimble and always like to nibble at your vehicle, so stay alert! 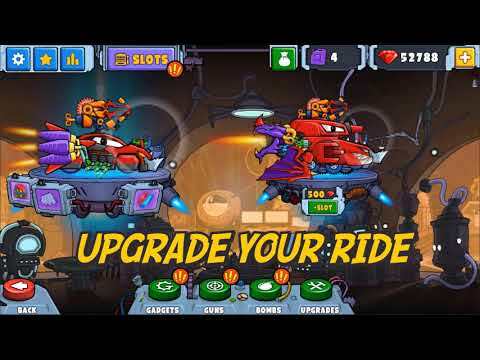 Gather super guns and boosters to help you destroy these evil mechanical creatures before they destroy you!